After 30 years of beaming others up, Scotty has finally left the engine room and beamed to parts unknown. 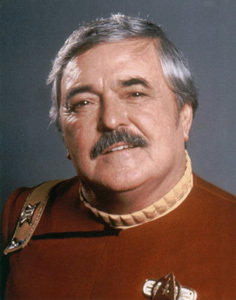 James Doohan has lost his battle with Alzheimer’s Disease, passing away early this morning at his house in Redmond with his wife Wende at his side. He was 85. Last year I blogged about just missing Doohan’s last public appearance as he received his star on the Hollywood Walk Of Fame. I’m still kicking myself for that lost opportunity. The universe seems a smaller and sadder place today. Memo to the folks in Silicon Valley: You will have good jobs for 20 more years. By 2020, though, computer chips will be cheaper than bubble-gum wrappers, and PCs will be in museums.